Taxotere Permanent Baldness Lawsuits | Hupy and Abraham, S.C.
Taxotere was first approved by the Food and Drug Administration (FDA) in 1996. At that time, Taxotere was approved to treat breast cancer. Over the years, its use has been expanded to treat other forms of cancer including prostate cancer, stomach cancer, head and neck cancer, and non-small cell lung cancer. Thousands of patients who have used this medication have filed lawsuits claiming that the drug manufacturer, Sanofi-Aventis US, hid the risk of a significant side effect. As of 2018, these cases are currently pending in multidistrict litigation and the first bellwether cases are set to go to trial in 2019. 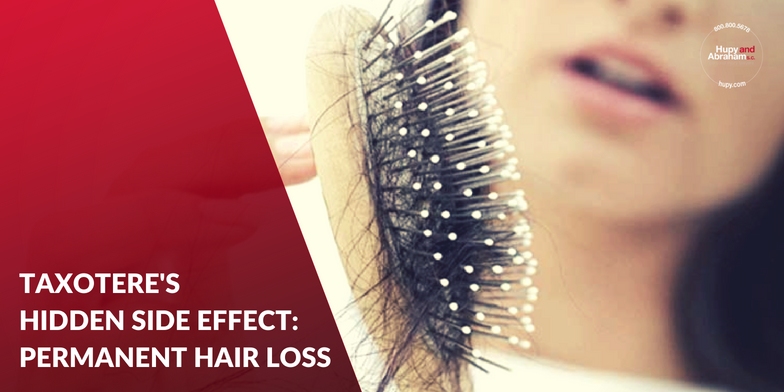 While temporary hair loss is a common side effect of cancer-fighting drugs, permanent hair loss (also known as permanent alopecia) is not a common chemotherapy side effect. More than 8,000 women who took Taxotere to treat breast cancer allege that they have suffered permanent baldness because of the drug. They further allege they have suffered physical, financial, and psychological damages because of their alopecia and that they may have considered other treatments had they been warned that they might become permanently bald after taking Taxotere. The drug maker failed to properly test Taxotere. The drug maker sold Taxotere without disclosing the risk of permanent alopecia or warning patients and doctors of the risk. The drug maker concealed information from the public. Sanofi-Aventis allegedly knew about the risk of permanent baldness and warned patients of the risk in countries other than the United States. Do You Have a Taxotere Case? In December 2015, the FDA required Sanofi-Aventis to add a black box warning to Taxotere to warn patients of the risk of permanent baldness. If you suffered permanent baldness from Taxotere that you took prior to December 2015, then you could have a claim for damages. You had difficult decisions to make when it came to cancer treatment, but you did have choices—and you deserved to have information from Sanofi-Aventis so that you could make an informed decision about your own treatment. While you didn’t have the necessary information to make an informed decision about using Taxotere, we want you to have all of the information that you need to make an informed decision about protecting your legal rights. If you have suffered permanent baldness from Taxotere, please contact our experienced drug injury lawyers as soon as possible to schedule a free, no-obligation consultation about your potential claim. Additionally, we encourage you to download a free copy of our report, Taxotere: What You Need to Know About It, today so that you can learn more about your rights and possible recovery. ?What should I do if I have suffered an IVC filter injury in Illinois? ?Do I have the right to file or join a class action pharmaceutical lawsuit? ?How long do I have to file a pharmaceutical class action lawsuit in Illinois?